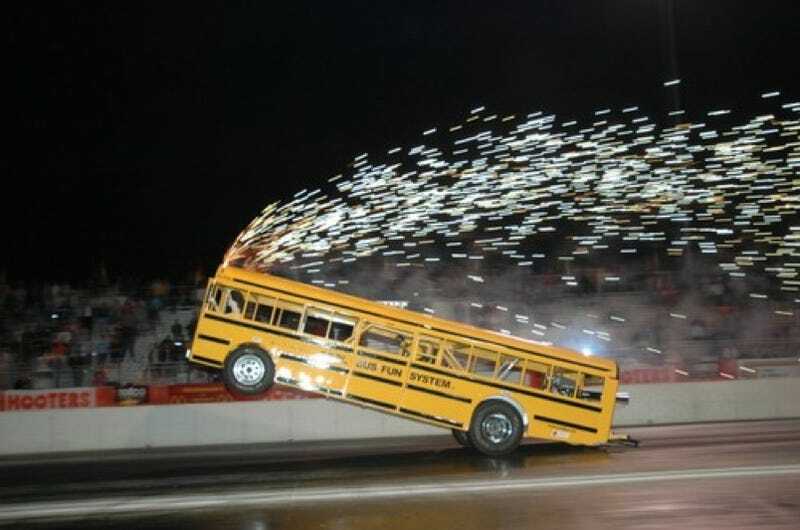 The one-of-a-kind exhibition drag-racing "Cool Bus," built by Ken Nelson, crashed at last month's O'Reilly Thunder Jam. Luckily, Ken was uninjured. Let's take a closer look at the "Cool Bus" and video of the crash. The "Cool Bus" is a one-of-a-kind exhibition drag racing vehicle, hand-crafted by its owner, Ken Nelson, to look like a school bus (built to scale, of course). At 20 feet long, 6 feet wide and 6 feet high, we're told it's believed to be the longest wheelbase wheelstander ever created. The highly detailed body designed and built by Ken, is made of aluminum and fiberglass. All lights and flashers operate in the same manner as a real school bus and the body is painted regulation yellow and black with all the details you'd expect from a school bus. Well, except it's the "Cool Bus." The chassis is constructed of steel tubing and meets all NHRA and IHRA safety specifications including a full roll cage, safety harness, emergency shut-off switch and other requisite safety items. But it's under the hood that's the really cool thing in this school bus. The "Cool Bus" wheelstander is powered by a rear-mounted, alcohol-fueled, blown and injected big block Chevrolet engine which produces around 1000 HP! The power is transferred to the rear wheels through a GM 400 Turbo transmission, into a transfer case, then into a full floating rear-end. Ken has over 25 years experience as a car and chassis builder, having built his last five wheelstanders. He has also built vehicles for several other exhibition teams and many street rods. He's not some newbie in a garage-built monstrosity. But that doesn't stop accidents from happening. Flash forward to the end of this past month — March 28th — and this video of Ken Nelson's "Cool Bus" Wheelstander hanging on to the wheel stand for just a little bit too long, crashing at the O'Reilly Thunder Jam at Edinburg International Raceway in Edinburg, Texas. The good news is, he was out of the bus before the rescue crews got there and was up and walking around with no injuries. The bus however, looks like it'll be out of commission for a little while. Hopefully not too long.